The Library is pleased to announce that we now have a beautiful piece of art on the outside wall of the building. 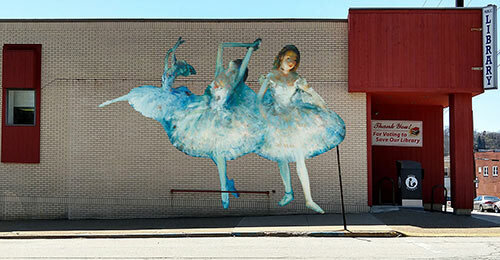 Westmoreland Museum of Art, working with the Jeannette Arts Council, has brought the Art Happens Project to Jeannette. The Library’s piece was the first to go up. The 3 Dancers are taken from the painting: “The Green Ballet,” by Everett Shinn, and were chosen to honor the 3 Dance Schools in Jeannette-Simply Nikki, the Dance Factory, and Jean Cooke. Come on down and see it! Make sure you take a selfie in front of it to get free admission to the museum! 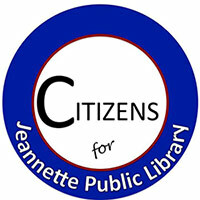 The Jeannette Public Library provides for personal enrichment, cultural programming, educational support and life long learning for the citizens of this community. To apply for a library card you will need to: Come to the library and read our library rules and regulations. Agree to follow these rules. Children need a parent present when applying. Photo ID with current address is required for adults or parents applying for their child’s card. Other proof of residence includes a current utility bill or lease. Fill out and sign the application and the back of the library card. A staff member from Representative Justin Walsh’s office will be at the library every first and third Wednesday from noon to 6:30 pm. Visit Rep. Walsh’s website to learn more about the services provided. Digital scans of all Jeannette Highschool yearbooks are now available for free on SmugMug. The books date from 1916 to 2007 and contain loads of interesting Jeannette nostalgia and history!